The West Coast Express Santa Train is rolling again today, and has another trip from Mission to Vancouver planned for next Saturday, Dec. 16, for Christmas shoppers and selfie-taking sightseers. Tanya Sawchuk is in her 23rd year as a volunteer for this unique cause, and again rallied her adult children and their friends to help at the Port Haney Station in Maple Ridge on Saturday morning. “The’ve been coming down with us ever since they were little, and now they’re adults and they do this to help the Christmas Hamper Society of Ridge Meadows,” she said. The Santa Trains departs Mission City at 10 a.m., and stops at all WCE stations along the way. Once in Vancouver, riders can enjoy a day of holiday sights and sounds before returning home from Waterfront Station at 4 p.m.
Riders get a free WCE ticket in exchange for a new, unwrapped toy donation (worth about the same as a WCE pass) for their community toy bureau. The West Coast Express North Pole Station (at Waterfront) will be open as of 2:45 p.m. for holiday activities and a photo op’ with Santa. Dairyland provides a complimentary taste of egg nog while riders wait for their trip home. 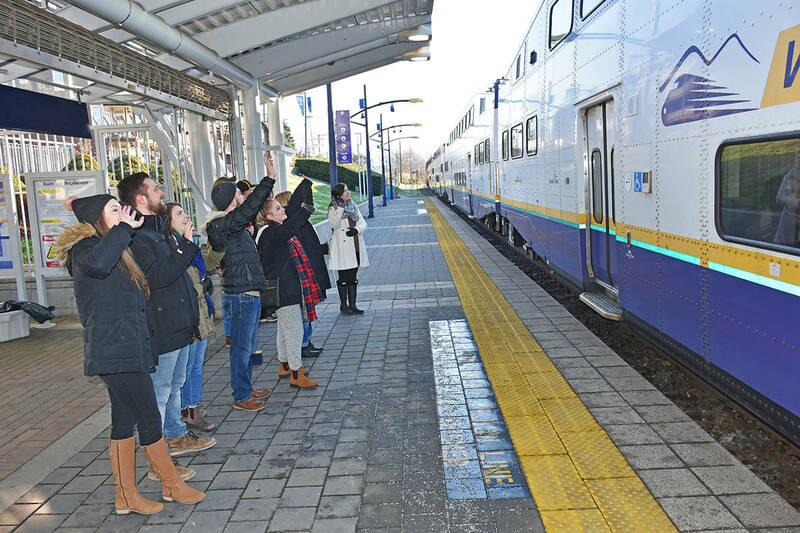 The train leaves Port Haney at 10:19 a.m., Maple Meadows at 10:25 a.m. and Pitt Meadows at 10:29 a.m.
On the way back, the train arrives in Pitt Meadows at 4:44 p.m., Maple Meadows at 4:48, Port Haney at 4:54 p.m and the end of the line at Mission at 5:15 p.m.